On our website we show the publicity picture for the London Underground mixed retail booklet. 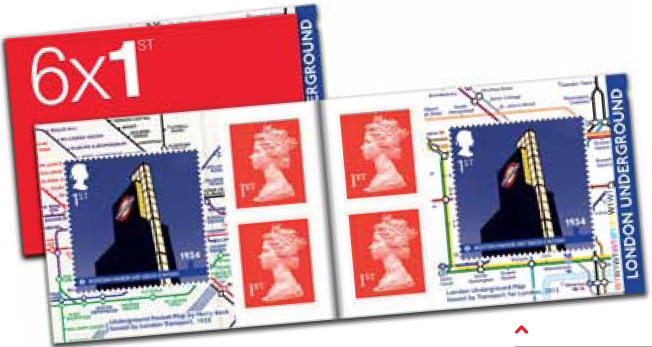 The background to the LU stamps is Harry Beck's London Underground map on the left, and the newer map on the right, with the cylinder numbers shown vertically at the right. As we know we can't always rely on the pre-issue images - but as I received a pack containing no cylinder numbers at all, I still don't know whether the image is accurate or not. We can report that the year code is M12L and the source code MCIL. Yes, that's what the announcement about the 3 January issues means. After the Diamond Jubilee definitives the colour of 1st class stamps changed to Royal Mail Red, rather than reverting to gold. It's a shame that Royal Mail didn't issue the two different 1st Class London Underground stamps in the booklet (Commute to the Suburbs & Boston Manor) rather than double-up on the Boston Manor stamp. Does anyone have an idea of why? My view exactly. The only thing I can think is that the stamp is contemporary with the map on the left. Although issued date is 9th January, the sheets have 8th January printed on them hence my local post office has just them to me! I've just been following a discussion on twitter on this very subject John. Apparently the presenation pack has 8th, and some of the literature has Tuesday 9th. May account for the fact that I had LU150 stamped customer orders prepared to post today, which will now go out tomorrow. Either that or I'm just getting old and forgetful ?